This impressive one-man feat races toward its end at neck-break speed, with the mesmerizing Josh Sticklin as Ross, an ebullient young man, who dreams of escaping the turbulent Belfast by buying a set of clubs and becoming a professional golfer. Ross bounces in and out of his apartment, down into the republican vs. loyalist riots on the streets. He collides with a thrilling and hilarious cast of characters—all played by him, the narrator. 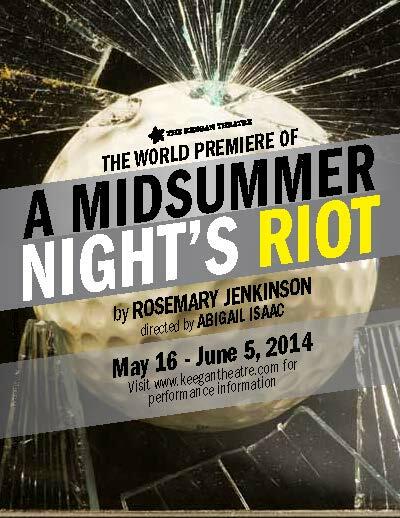 And that’s exactly what A Midsummer Night’s Riot does. Sticklin’s character…is intensely human. His boyish charm, unstoppable energy, slangy vernacular, and penchant for getting himself into trouble make him a fascinating specimen for examination and consideration. And he’s darn entertaining too. In its now permanent home at the old Church Street Theater, Keegan’s production team shines, giving Sticklin a backdrop of stairs and windows. An old lectern serves as synecdoche for the local pub where Ross and his friend Minter regularly hob-knob with their fellow rioters. A raised platform serves as the upstairs apartment, where Ross finds himself in flagrante with Minter’s mother. Yet even real life romance does not deter from his dreams (both day and wet) of the “ninja girl,” a mysterious rioter he has glimpsed in the streets at night. Like the golf clubs he can’t afford, the ninja girl serves as an escape from Ross’s reality. And it is here that Jenkinson and brilliant director Abigail Isaac make their point: What lies ahead for these youth bent on destroying each other in the streets? Even if they have dreams and aspirations, is there hope that they might escape the cycle of violence that has consumed their community?